There can be few more familiar faces at Bryn Masonic Hall than that of Alan Slater. Living ‘on the shop’ Alan can always be seen, either at meetings, or working tirelessly in the grounds, keeping everything tidy, safe and secure. 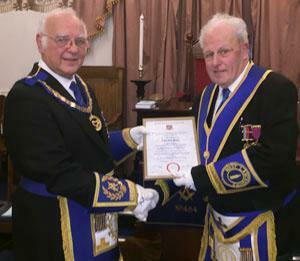 David Ogden (left) presents the celebratory certificate to Alan Slater. It was therefore appropriate that Lodge of Faith No 484 proudly called an emergency meeting to coincide with the anniversary of Alan’s initiation, and hosted the celebration of his golden jubilee at his beloved Bryn Masonic Hall. Lodge members assembled to celebrate Alan’s achievement, and were joined by no less than 88 visitors. All were delighted to welcome Assistant Provincial Grand Master David Ogden, who was accompanied by grand and group officers, and Provincial Deputy Grand Director of Ceremonies Barry Fitzgerald. The initial business of the lodge being completed, the distinguished guests were admitted and David was offered the gavel of the lodge by Alan Slater WM of the lodge, which was generously accepted before the APrGM proceeded to occupy the chair to conduct the celebration of Alan’s remarkable achievements in his 50 years of Masonry. David commenced by relating some facts about what life was like the year Alan came into Masonry. He then commanded that Alan be placed before him and, and before he related details from Alan’s biography, the secretary read the minutes of the meeting from 50 years ago when Alan was initiated. As a well-known and an experienced Mason, Alan is often heard prompting and directing operations from the side-lines. On this occasion he was given specific instructions by the APrGM that he was not allowed to prompt anyone, much to the amusement of the brethren. Alan was born in 1942 and attended Rectory C of E Primary School, followed by Ashton Grammar, and although he was academically quite clever, his parents found it necessary to bring him out of school to help with the family poultry business, due to his mother’s ill health. Eventually, Alan took over the family business and continued to serve the area and was well known, driving Slater’s mobile shop around the Ashton, Bryn and Garswood areas. Forever active, after retiring he then started working at the various race courses in the area, becoming again a familiar face around the circuit, and encouraging many other local brethren to join him. Pictured from left to right, are: David Ogden, Alan Slater and Geoffrey Porter. Alan was married in 1965 at Holy Trinity Church, and after some difficult confinements, he was eventually blessed with daughter Pauline, and now have 4 grandchildren, who are regular visitors to his home as he likes to spend as much time with them as possible. Alan originally lived in Downall Green and has been a regular church goer and church warden at Holy Trinity. It was 18 years ago that Alan moved to his present home at the Masonic hall. The amount of work and effort he has put into the upkeep of the hall cannot be understated. Clearing the entire car park of knotweed, removing every single root by hand, building a wall, shovelling snow before the arrival of members, and constantly weeding and tidying is the normal activity for Alan. Amongst the many other jobs he does, he also provides valuable security for the buildings and cars left on the premises. There is no doubt that he is a great asset to the buildings and all members, and also whoever uses the buildings, should appreciate and thank him. In Freemasonry, Alan was initiated into Lodge of Faith in 1969. His father was in Makerfield Lodge No 2155, and his cousins were in Vigilance Lodge No 6236, and it was not until 1994 that he was installed as master in his mother lodge. Alan received Provincial appointment from Makerfield Lodge in the Leigh Group in 1995 as PPrSGD and following two further promotions now holds the rank of PPrJGW. Alan has constantly held office in his Craft lodges throughout his 50 years. In Royal Arch, Alan is a member of Makerfield Chapter No 2155 and a founder of Ashton Trinity Chapter No 8821, and is a staunch and active participant in both. He holds the rank of PPrGSN. 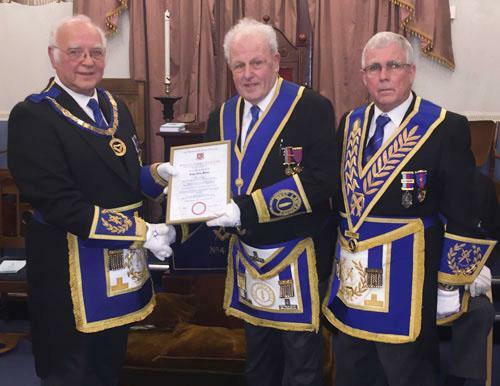 David then summed up the commitment and contribution of Alan, and then asked Geoffrey Porter to read the jubilee certificate issued by the Provincial Grand Master Tony Harrison before presenting the certificate to Alan with his congratulations. The assembled brethren greeted this with generous applause. In response Alan expressed his gratitude to everyone in attendance and to David for his warm words. The proceedings inside the lodge being complete, David and Alan then processed from the lodge accompanied by the grand and acting Provincial grand officers, to enjoy a bountiful festive board full of tributes and shared by many friends who respect this wonderful man and Mason.